A few years ago, I was having lunch with Gretchen Rubin, bestselling author of Better Than Before, The Happiness Project, and Happier at Home, and host, with her sister Elizabeth Craft, of the Happier with Gretchen Rubin podcast. She gave me a wonderful happiness idea that I think of often. She told me how she thinks of the happy unexpected things that happen as "a surprise in the mail." You just never know when a surprise will come "in the mail" and these little surprises can make your day. Since then, I've emailed her a few times with my little surprises in the mail. Even on a seemingly bad day, knowing that at any minute a happy surprise can "come in the mail" can get anyone excited for what's to come. 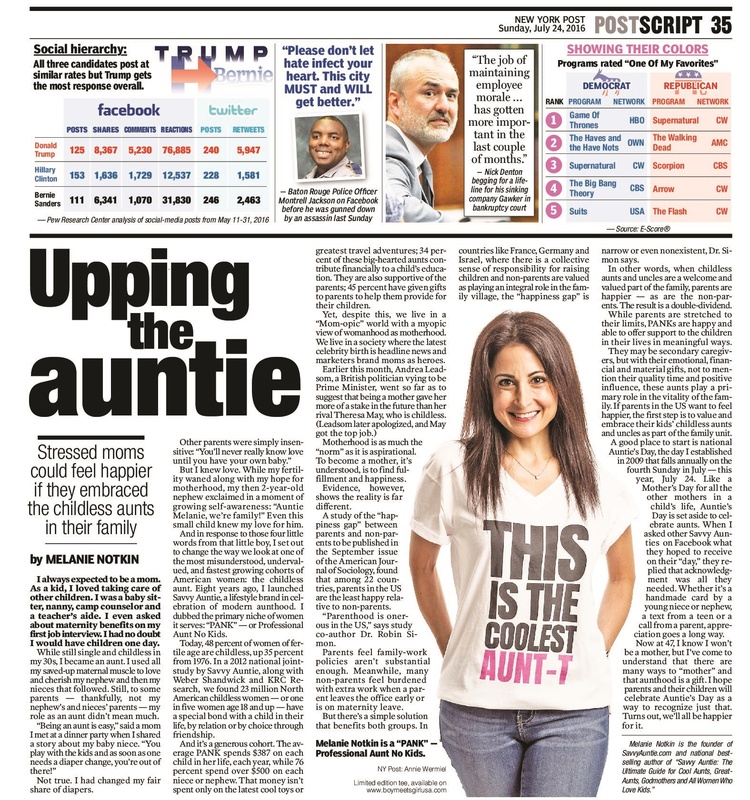 Well, yesterday, I received a big "surprise in the mail" when New York Post re-shared an article I wrote for the newspaper in celebration of the 8th annual Auntie's Day, back on July 24. In a short series of articles reflecting on 2016, NYPost included my article: The most undervalued women in America are childless aunts, calling it: "Another 2016 Facebook favorite: Meet the "PANK" – a Professional Aunt No Kids." While the original article published in July 24 in print and online was the #1 article for that day and remained in the top 3 articles on NYPost.com for several days - and was the #2 most popular article of the week. Now, it is getting incredible traction the second time around! The Facebook Likes and Shares are in the multi-thousands! More PANKs are discovering Savvy Auntie! What a wonderful surprise! Thank you New York Post for the best way to say thanks for all the memories and happy surprises in 2016! Here's to many more in 2017 for us all!